Feast your eyes on the Fuse Toledo Style Antique Steel Stool. A fusion of practical features and factory style, this is a great piece for adding character to your bar area. Influenced by the original draughtsman’s stools, the Fuse Toledo Stool has vintage chic. Fashioned from curved wood, the seat and back have a light finish and are connected by a metal bracket. 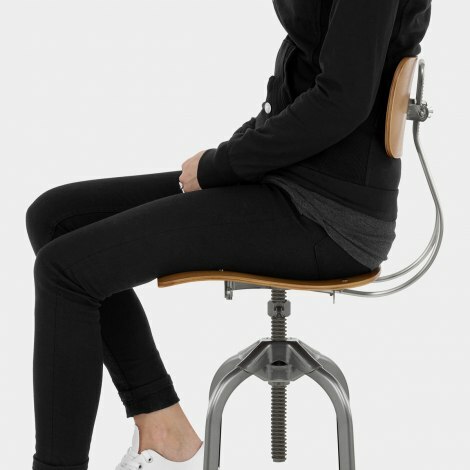 The backrest also has a height adjustment mechanism for the best support. A locking screw thread sits below the seat and allows for variable height, while a 360-swivel feature is also included. For a vintage touch, the antique steel frame has an industrial look that contrasts the light seat. With a unique bracing bar design between the four legs, a circular footrest surrounds the frame to offer a supportive perch. The feet are self-adjusting for use on uneven surfaces and protective pads are included to reduce the risk of damage to your floors.